Those folk who’d sell their souls for a rare snowdrop have two things in common – a willingness to open their wallet for a small, vulnerable bulb that flowers only briefly once a year, and an eye for detail. I mock not, for man has succumbed to uglier addictions, but one can understand why the uninitiated struggle to fathom galanthophiles’ fascination with these simple flowers. When a collection of snowdrops is viewed together the differences between them become more apparent. One of the most distinctive cultivars, instantly recognisable once you have seen it once, is Galanthus ‘Diggory’. In bud it looks pretty ordinary, but once open the flowers puff out like a partially inflated balloons, the outer petals ridged and puckered like seersucker pillows. They attract me in the same way as the fuchsia buds I loved to pop as a child. 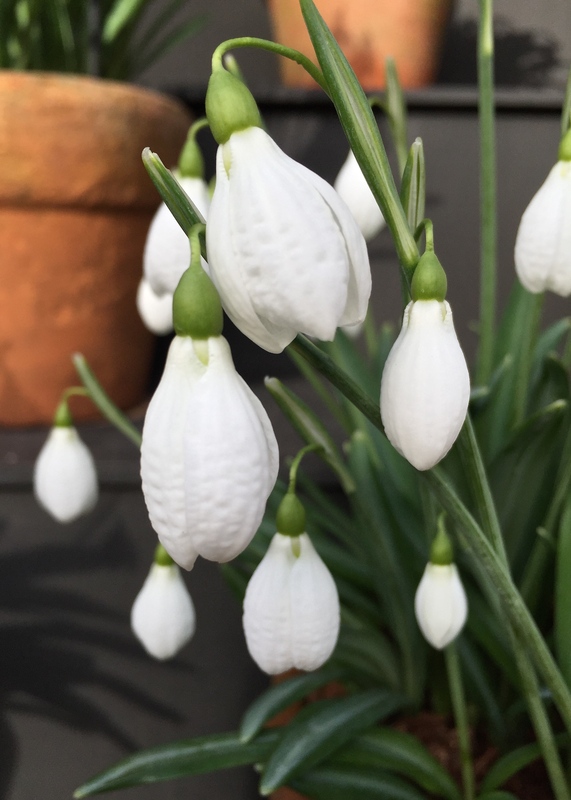 Galanthus ‘Diggory’ was discovered in a garden near Wells-next-the-Sea in Norfolk by Rosie Steele and Richard Hobbs and was named after Rosie’s late son. One of the parents is thought to be G. plicatus, which makes it a vigorous plant, although slow to increase. 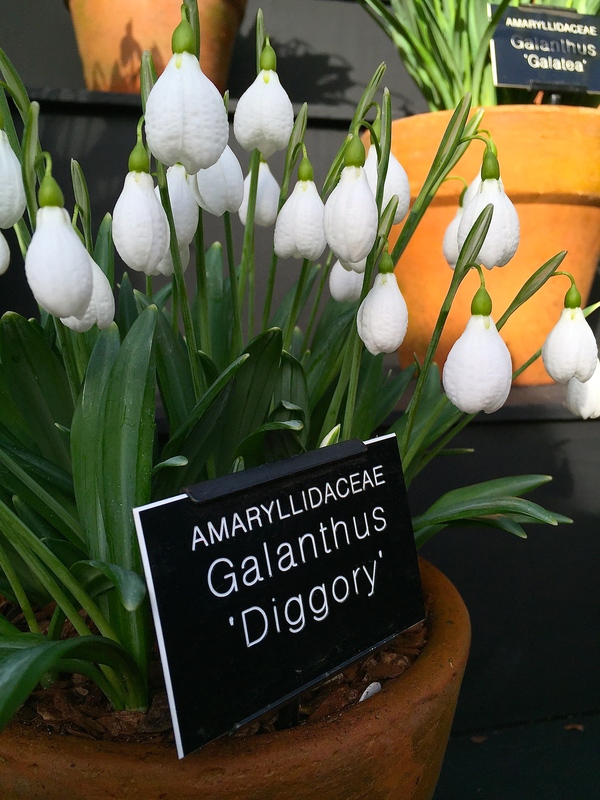 If you are digging Diggory, bulbs ‘in the green’, priced at £25, are available now from Avon Bulbs. Resistance is futile. “puckered like seersucker pillows”… an apt description. Interesting new snowdrop! Yes, they do have a heavenly look of fresh bedlinen about them. Definitely digging. Interesting, but proof that different isn’t always better. Diggory is certainly on my list. It is one of my favourites. A lovely photo of it, showing off all its dimples. It is a very nice one, will you keep it in a pot? I am assuming that you have purchased! Ah no. My purchase was a burly white called ‘Seagull’. It will be a miracle if it survives the thuggery in our London garden, which is why I bought lots of nivalis as well! I have to say the marginal differences in the markings on snowdrops don’t excite me much (although I’d make an exception for Grumpy), and nor do I ‘approve’ of yellow marked snowdrops. However, I was looking through the Avon catalogue last weekend and guess what? it was Diggory that really appealed to me. I still haven’t quite got my credit card out though…. Fortunately, I’m immune and go no further than Galanthus nivalis ‘Flore Pleno’ and then only because it came from my last garden mixed with some G. nivalis. Well I’m in love with Diggory. How could I not. So cute with those puffed, waffled petals. This will be my fourth different snowdrop.